Chart ranking company Oricon is celebrating its 40th year in the business. To mark the occasion, it has released a ranking of the biggest sellers of the past four decades. 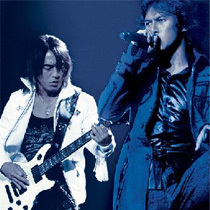 Top of the male rankings is rock group B’z, who have sold a staggering 41,450,000 albums and 33,210,000 singles. They also have the most million-selling singles (15) and albums (19). And the best-selling female artist is Matsuyoya Yumi, with a total of 29,300,000 albums sold. Hamasaki Ayumi has sold the most singles, currently 19,840,000. With B’z still very much on top of their game, their records will keep extending and are unlikely to be beaten anytime soon. Yuming is somewhat past her heyday and has the likes of Hamasaki and Utada Hikaru on her tail. Johnny’s Jimusho pop duo Kinki Kids got a mention for the fact that every single (22) and album (6) they’ve ever released has gone to top of the Oricon charts. Other record holders are folk singer Inoue Yosui, who topped the album chart for 68 weeks in a row, and 80s idol duo Pink Lady who held the No.1 spot on the singles chart for 63 straight weeks. • NHK announcer Shimazu Yuriko (32) is engaged to marry a lawyer in September. According to the “Shukan Bunshun” weekly magazine, the pair met last year when Shimazu was on vacation in New York, where her fiancee was working. They started going out when he returned to Japan. • Actress Uchida Yuki (30) is to make her drama comeback. She will appear alongside Tamura Masakazu (62) in the TBS drama series “Dare yorimo Mama wo Aisu”, starting on July 2. It will be Uchida’s first work since she and actor Yoshioka Hidetaka (35) divorced last December, and her first dramatic role she they starred together in “Kita no Kuni Kara” in 2002. It was that long-running series that brought them together, and they even got married on location in Furano, Hokkaido.